APRIL 2018 • E&MJ 81 www.e-mj.com SUPPLIERS REPORT The Lithium Industry and Chile's Role Author: Gustavo Lagos Cruz-Coke Professor Gustavo Lagos has been a direct witness as well as a permanent and meticulous chronicler of this enthralling history that today is at an inflection point. Lagos is –almost certainly– the Chilean professional who has most studied and written about the lithium resources of our country, their characteristics, opportunities and restrictions. Absolutely up-to-date DOWNLOADABLE EDITION : Price: US$ 40 + VAT SALES: Cristián Valdivieso cvaldivieso@editec.cl +56 2 2757 4259 and restrictions. Absolutely up-to-date DOWNLOADABLE EDITION : Price: US$ 40 + VAT power to achieve their metallurgical tar- gets, Glencore Technology reported. "The remoteness of the site means high ener- gy efficiency and low installation cost is needed, Paul Telford, general manager, Glencore Technology, said. "We have had a long relationship with the Red Dog site since 2007, having provided a Jameson Cell for their prefloat cleaning circuit, and two M5000 IsaMills for their zinc circuit." Separately, GeoProMining (GPM) signed a collaboration agreement with Glencore Technology to market the Albion Process, the latter's atmospheric leaching process. GPM will have the right to mar- ket the technology in Russia in partnership with the former. The agreement combines GPM's expertise on the process and knowl- edge of the Russian refractory gold mar- ket with Glencore Technology's expertise in processing technology. GPM used the process at its Ararat processing plant in Armenia to increase overall recovery from sulphide concentrates from 20% to more than 95%. The plant, now operating above design throughput and recovery levels, was supplied by Glencore Technology. The agreement means the GPM plant can now be used as a training facility for a combi- nation of ultrafine grinding and oxidative leaching. It will become an exemplary plant to show potential clients the Albion Process in operation and to provide training of operations, maintenance and technical personnel, Glencore Technology reported. Rail-veyor Begins Hauling Ore at Goldex Rail-Veyor Technologies Global Inc. an- nounced its Rail-Veyor system hauls all production material at Agnico Eagle Mines Ltd.'s Goldex mine in Val-d'Or, Quebec, Canada, for their Deep 1 project. Installation of the 3-km underground sys- tem began as part of Goldex's new Deep 1 project, which launched in July 2017. The Rail-Veyor system was installed to haul material at lower operational costs than other alternatives, such as trucks or conveyors, Rail Veyor Technologies report- ed. As mine production ramps up, a total of six Rail-Veyor trains are used in a fully automated and synchronized operation. Stantec to Acquire Norwest Alberta-based engineering and design firm Stantec signed a letter of intent to acquire Norwest Corp. With the addition of Norwest, Stantec's Energy & Resources business op- erating unit will add a strong mining prac- tice to the company's portfolio in western Canada. Norwest, a 140-person energy and resources firm headquartered in Calgary, Alberta, has offices in Vancouver, British Columbia; Denver and Trinidad, Colorado; Salt Lake City, Utah; and Charleston, West Virginia. 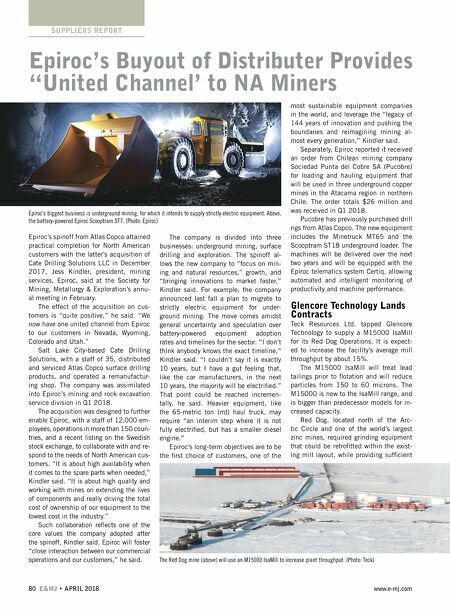 Norwest has supported a number of international mining projects in eastern Europe, South America and China. The ac- quisition is set to close in Q2 2018. 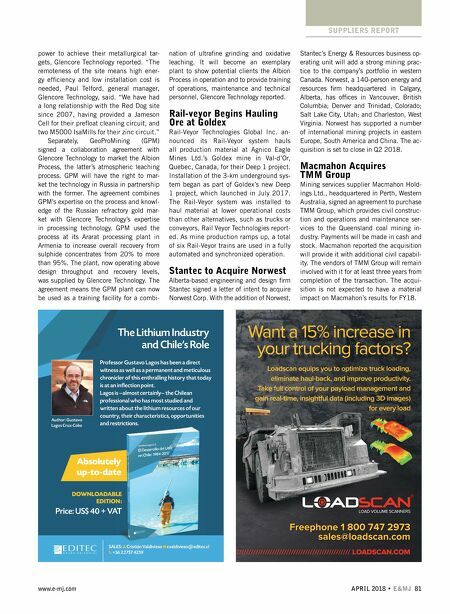 Macmahon Acquires TMM Group Mining services supplier Macmahon Hold- ings Ltd., headquartered in Perth, Western Australia, signed an agreement to purchase TMM Group, which provides civil construc- tion and operations and maintenance ser- vices to the Queensland coal mining in- dustry. Payments will be made in cash and stock. Macmahon reported the acquisition will provide it with additional civil capabil- ity. The vendors of TMM Group will remain involved with it for at least three years from completion of the transaction. The acqui- sition is not expected to have a material impact on Macmahon's results for FY18.